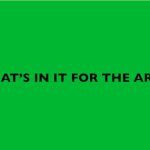 ADIE/WHAT´S IN IT FOR THE ARTS? Moderator: Josefine Wikström (SE) Invited guests: Tero Nauha (FI), Anne Juren (AU/ SE), Anders Paulin (SE), Malin Arnell (SE), Paul Russ (GB), Anna Koch (SE), Katja Kirsi (FI) a.o. Artistic research is relatively new in Sweden within the performing arts and choreography field. Its role and function for the artistic field and corresponding artistry is and has to be debated. What is needed for this kind of academic knowledge production to be of value for the art practices in question? What kind of possibilities or hindrances are there to be conscious about and to discuss with the aim to an furtherance of the artistic field? What kind of relation to and exchange with the art scene, its venues and performace context, are there and should be there? Shortly, what is there or not in artistic research, actual or as possibilities, for the art, its labour and scene? This event follows on from provocations introduced at an event called 'Talking Thinking Dancing' (June 2017, Dance4, UK). This crucial continuation will place artists, researchers and the cultural sector in dialogue and includes participants from Sweden, Finland, UK and beyond. It coincides with a week-long international teaching/research exchange for Doctoral Candidates initiated by the Artistic Doctorates in Europe Project (ADiE). Thursday March 22 at 19.30-21.00. With focus on visions or non-visions for art making within artistic research and its effects. Friday March 23 at 12.30- 14.00. With focus of the impact of Artistic Research on the art scene. Invited guests: Malin Arnell (SE), Paul Russ(GB), Anna Koch (SE) and Katja Kirsi (FI) a.o. ADIE is a partnership funded through Erasmus+ to investigate and support the development of Artistic Doctorates in Dance and Performance. ADiE is a partnership between Zodiak Centre for New Dance, Kiasma Theatre and University of the Arts Helsinki (FI), Weld and Stockholm University of the Arts (SE), and Dance4, University of Chichester and Middlesex University (UK), funded by Erasmus+.